Today marks the 235th anniversary of the date thirteen states seceded from the British empire and formed thirteen independent countries. It is extremely important to note that in the original document the word “united” in “united States of America” at the beginning of the last paragraph is not capitalized. The “united” is an adjective referring to the nature of the states and does not refer to a country which did not exist at that point in time. In 1783, this independence was confirmed in the Paris Peace Treaty in which the British Empire specifically named each individual state and declared them to be “free, sovereign and independent States.”1 Many newer transcripts of the document deliberately capitalize “united” to attempt to support the “indivisible” narrative, but this is a blatant deception. These thirteen independent countries later delegated some of their authority to a central federal government and officially set up the United States of America, but the Declaration of Independence is a secession document. The Founding Fathers correctly viewed civil government as a covenant between God, the magistrate, and the people, such that when the magistrate breaks covenant with his people, the people have the right to establish new magistrates (1 Kings 12). Thus it is little wonder that the Declaration of Independence reads like a John Knox sermon as the Founding Fathers laid out the grievances they had with King George III. 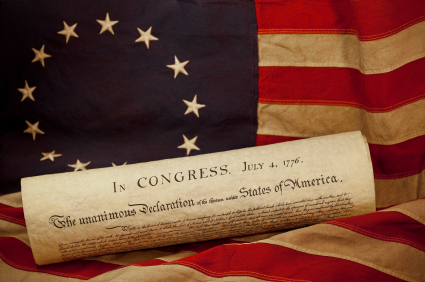 Most Americans (I mean, some Americans) know the opening lines of the Declaration by heart; however, much of the rest of the document is unfamiliar to the majority of Americans. The twenty-seven abuses and usurpations of which the American colonists accuse King George III in the middle part of the Declaration are rarely discussed anymore, and with good reason. If the general populace had a good grasp on the basis and justification for the 1776 secession, then they might begin to realize that their current situation is much worse than the tyranny of King George III, and our current tyrants would have reason to fear. Let us look at some of the Declaration’s abuses and usurpations, and their corollaries in the U.S. government. These are too numerous to name them all, but the U.S. government has repeatedly struck down laws by the states to outlaw abortion, protect gun rights, protect white Americans, close the border and/or deport illegal immigrants, uphold morality, and defend traditional marriage. The U.S. government arrested the governments of Missouri, Kentucky, and Maryland in 1861 and ruled the South from 1867 to 1876 as a military dictatorship. The U.S. government has done this, but in reverse: flooding America with tens of millions of unwanted third-world invaders. One in every ten workers is employed by the U.S. government,2 and the number of U.S. governmental agencies is massive and continues to grow in number, scope, and expense. The U.S. government has repeatedly launched wars without congressional declarations of war. The U.S. government has subjected the American people to unlawful regulations and compromised our sovereignty through international organizations such as the United Nations, World Trade Organization, International Monetary Fund, and many others. The U.S. government has repeatedly protected and rewarded those who do violence to maintain its tyrannic hold on the populace, for example, those who participated in Ruby Ridge and Waco, TX. In addition to Lincoln’s suspending habeas corpus during the War for Southern Independence and imprisoning thousands of Northern civilians under no charges and with no trials for years, the Patriot Act and other “homeland security” measures allow the U.S. government to declare a U.S. citizen a terrorist, strip him of his constitutional rights, and hold him indefinitely with no charges or trial. Consider Lincoln’s illegal war against the Southern states, the atrocities committed by the Northern forces, and the destruction of both the Northern and Southern American Republics in order to create the U.S. empire. Combined with the flooding of America with third-world invaders, the U.S. government struck down segregation and made every effort to leave white Americans defenseless to the murders, rapes, and theft inflicted upon them by blacks and other non-whites at astounding rates. The long train of abuses and usurpations suffered by the colonials under King George III is certainly long, grievous, and demanding of a revolution, yet the long train of abuses and usurpations suffered by Americans under the U.S. government is far longer, much worse, and even more demanding of a revolution. It is thus sickening to see millions of Americans celebrating the Fourth of July by waving the modern U.S. flag and celebrating the current U.S. government. These people have no understanding of what the Declaration of Independence is about. April 15th would be a much, much more appropriate day for these people to celebrate than the Fourth of July. I celebrate July Fourth and I think it should be celebrated; however, its celebration should be somewhat somber as we remember all the liberty that has been stripped from us. It should be celebrated with the thirteen-starred U.S. colonial flag and the thirteen-starred Confederate flag of their ideological successors, not the modern U.S. flag. It should be celebrated as an example of godly resistance to tyrants and the overthrow of tyranny, not slavish “patriotism” to a government far worse than King George III’s. It should be celebrated with calls for the united States of America to reassert their sovereignty against the tyranny of the U.S. government, not platitudes like “God bless America.” The Declaration should be celebrated as a secession document, not a sacrament of the god-state. May God grant us strength to resist the tyranny in our own day and, in the spirit of our forefathers of ’76 and ’61, to make right the long train of abuses and usurpations we have suffered. Previous story The British? 1776?